Oban Airport is located just 9 kilometres northeast of the busy coastal town of Oban on Scotland’s west coast. After an extensive improvement programme, in 2008 we became a licensed airport, welcoming scheduled services (and around 3000 passengers a year). 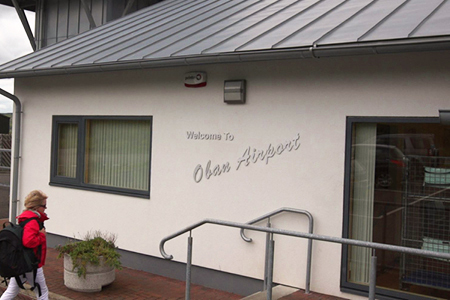 In addition to scheduled flights to Coll, Colonsay, Tiree and Islay, Oban Airport is a popular destination for private pilots and charter flights alike. Oban Airport is the perfect starting point for your very own Hebridean adventure – check out the possibilities today.